…is kind of like watching paint dry. Having finished off some orders in this heat I am able to get back to the vat today. Dyeing a bit of this and that as needed. As for the vat- it’s a happy vat at the moment. My little experiment of sewing a big cotton scrim bag to put down into it (keeping any organic materials out of my more open weave cloth as I dye) has been successful. I placed a few round stones in the bottom to keep it anchored below (somewhat). I also found I could move it over to my smaller light vat as well when needed. It is not forming much hana (flower) but has a nice coppery sheen on top and is a deep green and dyeing well. As a reminder- one needs to continue to stir the vat each day, especially when not using it. This action reintegrates the organic materials and any undissolved indigo in the vat. There are various theories on whether or not you want to get some oxygen into the vat while stirring (especially if the vat is in disuse). My particular theory is that since the bacteria consume oxygen they need at least a little bit ongoing to keep up the good work. That hana you see on your vat is a sign of good fermentation and the result of oxygen bubbling to the top and meeting with the air. I am anxious to get on with it while I am in the mood but the thread I am dying to use is still wet. I am working on a show piece for Houston (as in “show”, I mean a piece for the wall of my booth) and it seemed to me that I needed to set it aside and work on a smaller, simpler piece to solve some puzzles and answer some questions I was running into on the larger one. I also depend on wondering here to catch a few thoughts. Let’s just get clear on one thing. I am not a quilter. This may not even be a quilt. It is something. -then this is (a version of) a quilt. But maybe it is something else. Maybe it is a dyers cloth (run through with a needle)? Ahh…to define something. To categorize. To make it black or white. How can it be one thing and still be another? Two things at the same time? Or none at all. Maybe it is its own thing. That might ring true sometimes. Maybe for today. For now, it is a beginning. It is blue. Many blues. And it has moons. Many moons. I think the thread may be dry now. 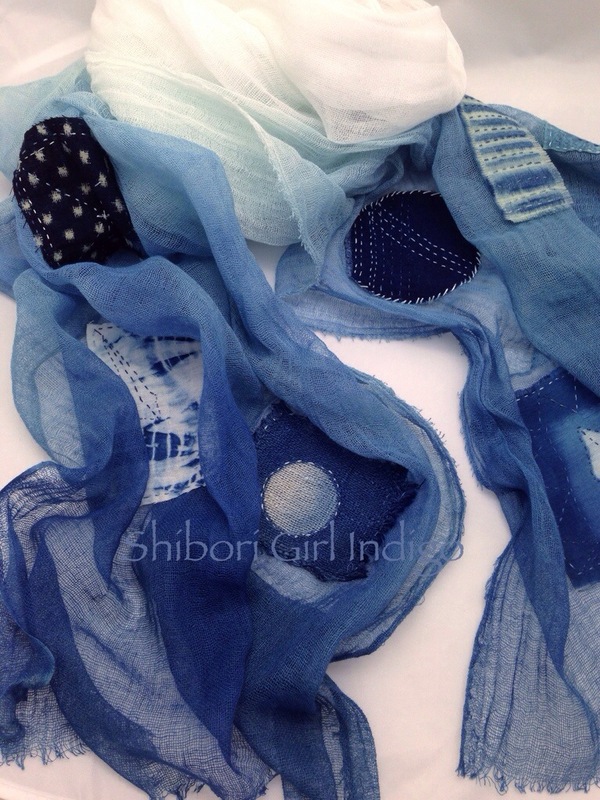 This entry was posted in dyeing, experimenting, houston quilt festival, itajime, natural dyeing, quilting, shibori and tagged dyeing, fementation, indigo, indigo moon, quilting, shibori, vat on July 29, 2016 by shiborigirl. It has been a while now since I created the silk shibori ribbon. Ten years to be exact. When I first created it there was no such thing on the market. Now it is everywhere. There are a lot of stories to tell (and I have told some of them here on the blog over the years) and this post will add one more. In the beginning when I made the ribbon, I wasn’t sure what it would be used for. I just was sure that it would be (used). And back in the day, I sent some around, made some things myself and went around showing it at trade shows. I started people wondering. A special friend (jude), in her special way, said something about it that really resonated with me. And it was. No two inches alike, the beauty was in part, in its imperfection. And I loved that about it. Of course this sort of thing creates certain challenges. As in how to communicate this aspect to the end user (relatively easy) and later on to the retailer (much more of a challenge!). As more people wondered, created with and enjoyed the shibori ribbon, I spent less time using it myself and more time just making it. Over time some of the designers took to making fabulous things with it. So much more wonderous than I had ever imagined and this was really fun. I looked at what was being made with the ribbon and took cues from those who were using it by dyeing colorways I hadn’t yet made. Some designers love the freeform possibilities while other designers love the perfection of the pleating. Did I say perfection? OOPS. It is not perfect. But I try to make it the best I can. More recently, as jewelry designs pop up that feature perfectly pleated sections of the ribbon, retailers and some customers want only perfectly pleated ribbon. They didn’t want the interesting beginning or ends of the rolls, so I began cutting them off and saving them. I thought they were delicious. So delicious that I refrained from putting them in scrap bags- to use them myself at some future magical place and time (when I had more time-ha!). 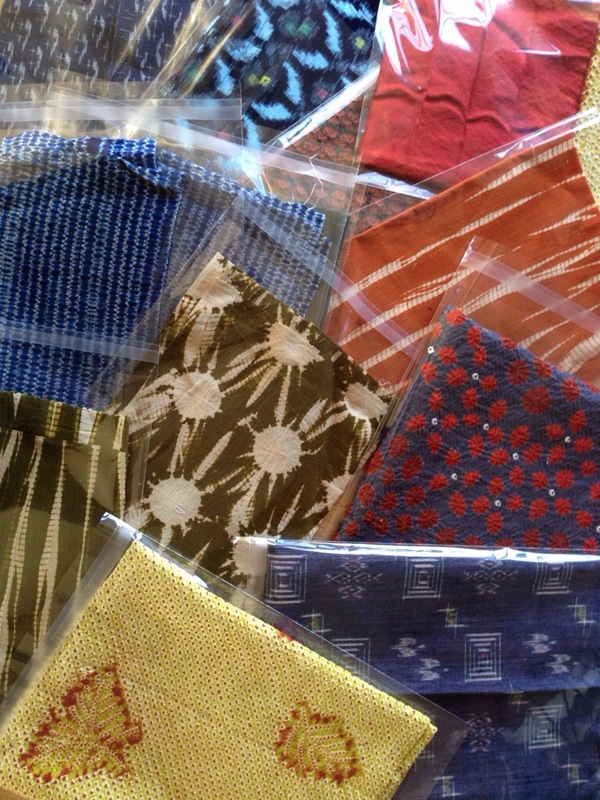 Plus I didn’t want to hear back from folks who thought they were getting reject ribbon bits in scrap bags. Then over time, since I was cutting off the ends anyway, I thought- why not just go crazy with the ends of the rolls. So I did. And now I have a nice little collection of these weird scrappy “tailings”, as I call them. They really are fun! More than an adventure…a happening perhaps. Each piece so unique and weird that it makes it great fun to create something with them. 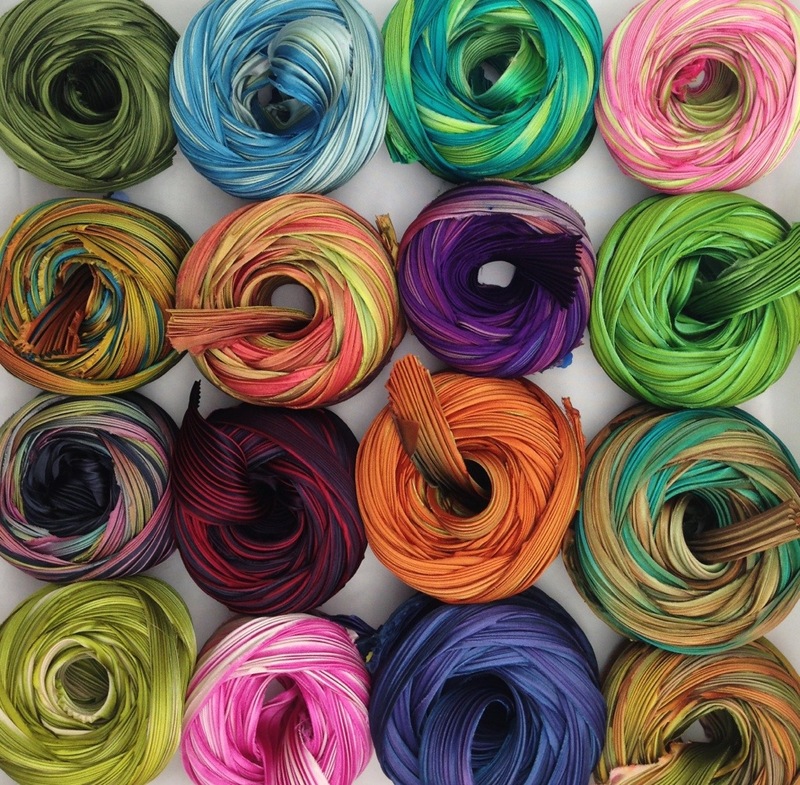 You can let go and really let the shibori ribbon lead the way. Really see something in a new way. What am I doing with this growing collection? 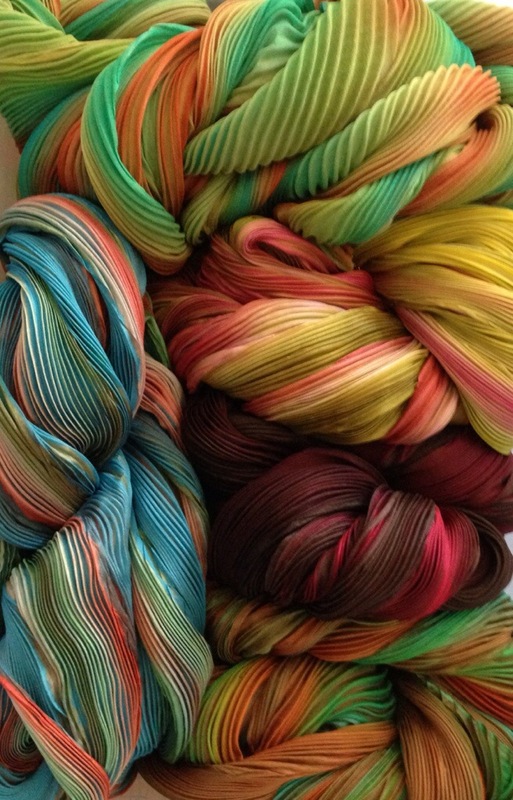 I’ll be teaching a shibori ribbon bead embroidery class using my “tailings” in Houston in the fall. I think we are going to have a really good time! And don’t forget- the upcoming workshop at the Japanese American National Museum is April 23 & 24. Sign up at the museum website. Hope Spring has made its way to wherever you are. It sure looks great here. This entry was posted in experimenting, houston quilt festival, shibori, shibori ribbon, silk, silk shibori ribbon, wondering and tagged Houston International Quilt Festival on March 28, 2016 by shiborigirl. It’s over and I’m home. A long 10 days of constant action and responsibilities. Classes, setup, teardown, travel and the lugging of more stuff than I want to remember. Until next year! I got to meet Deb McClintock of the blog NATURAL DYEING IN THE TEXAS HILL COUNTRY. I have enjoyed her adventures in natural dyeing for some time now. She also grows and dyes with indigo, madder and pomegranate (among other things). Thanks for taking the time to stop by Deb! Got to visit with Judith Montano a bit- she is so busy teaching every year at Festival she hardly gets down to the show floor. I have admired her book Elegant Stitches for many years- have a copy of the original edition from way back and love how her work has transitioned from crazy quilting into the lovely landscapes she does now. Had a little time with Brooke from Hannah Silks- we go way back. So far back that neither one of us can any longer remember how long ago! Was saddened to hear that her mom Hannah had passed away- she was the Hannah behind the silk. 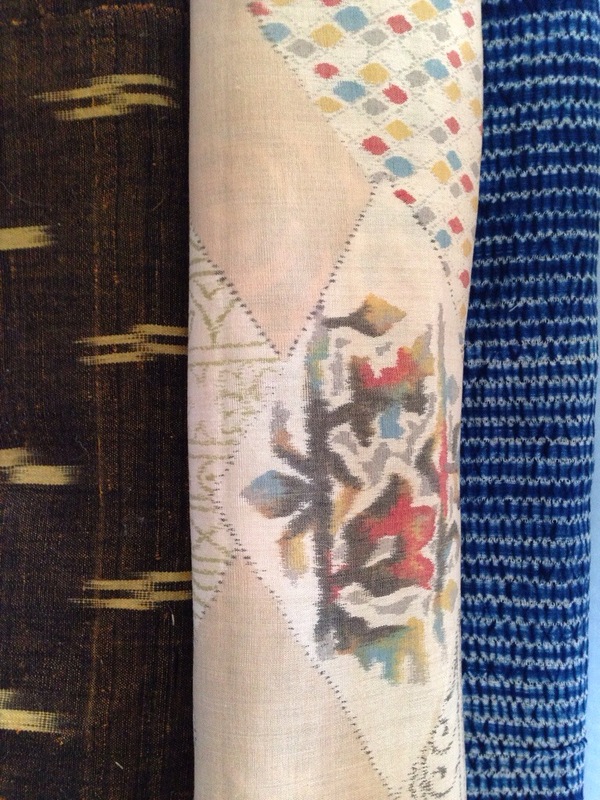 It was a pleasure to see and meet up with folks who appreciate the techniques and materials behind the textiles. I really enjoy the vintage dealers most I think (Carola Pfau of Textile Treasures, June Colburn, Carol Saber and others). Their knowledge of the textiles they sell is priceless. These textiles teach us so much. 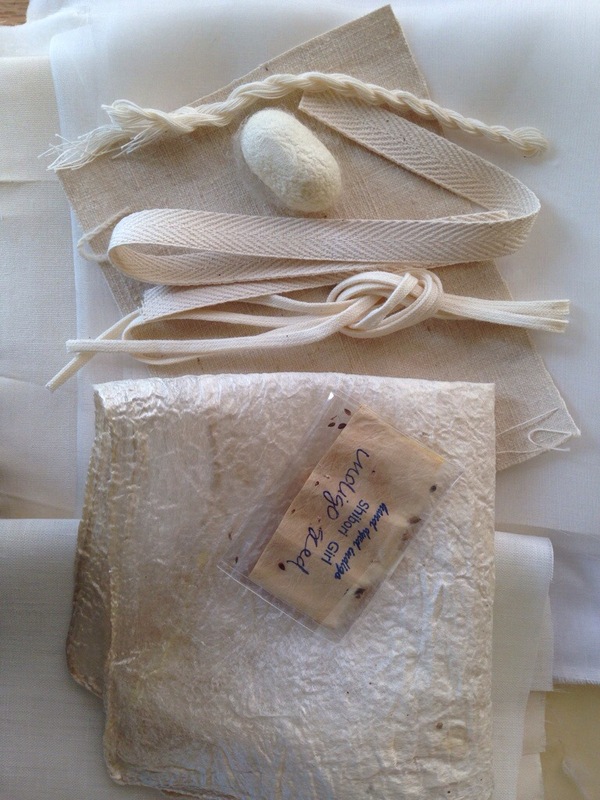 What do the textiles of today teach us? I wonder. A customer came to talk to me about what she had seen at the show. She felt that the prizewinning quilts were lacking something. She couldn’t quite put her finger on it at first. They were detailed, precise, painstakingly designed, impressive in scale, pleasing to look at…yet, something was missing. Our conversation turned to the missing element- the fact that so much of the quilting done these days and especially for big quilt prizes is technology and consumer driven. Ever more sophisticated machines, tools and fabrics dominate. In some of these pieces it causes them to feel sterile, almost as if they weren’t make by hand. But yet they are. Such precision in cutting, stitching, and profusion of color and design made available by the limitless palette of modern fabrics takes away something I think. Comparing the vintage quilts in the show with their newer cousins one causes one to wonder about all this. I know I am speaking blasphemy when I say this. One can wonder can’t one? People at the show were already excited about the 2017 Silk Study Tour to Japan and wanted to write me checks but I am not ready for that just yet. Hirata San and I are working out the new itinerary already and will have it up by January 30. This time we will do 12 nights and include Kyoto! What fun. To be informed of these details please sign yourself up for my Constant Contact newsletter in the sidebar and make sure to check Silk Study Tour as an area of interest. 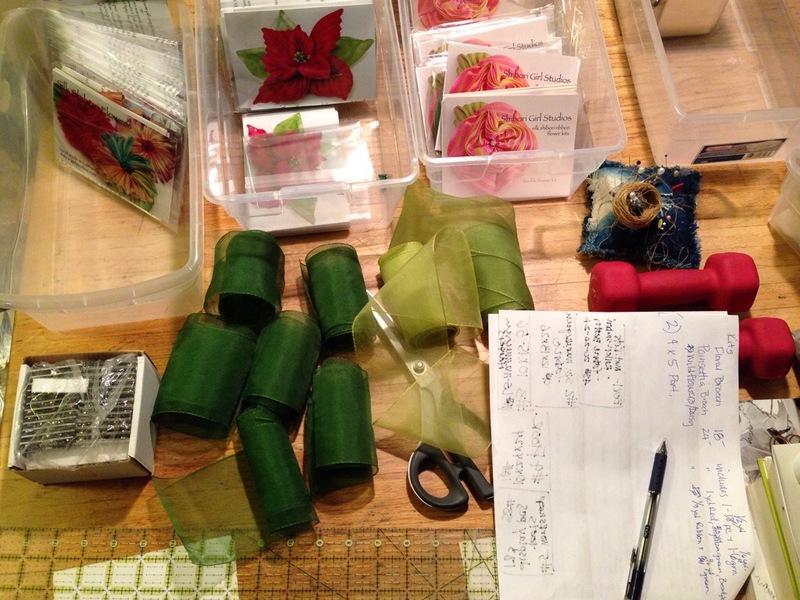 And in Freer news… I have added the Silk Shibori Ribbon Poinsettia Brooch PDF which includes links to the two videos on how to make this holiday piece. 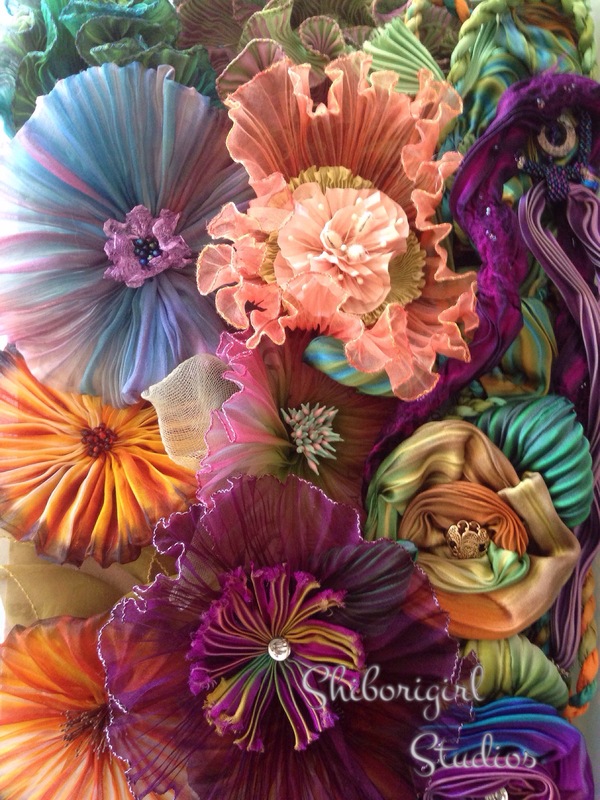 I have also added a PDF to the simple shibori fringed flower. This is easily made with small scraps you may have around. Please enjoy. Here are a few shots from the show- big thanks to Donna and Virginia for helping me get through it all- you both were integral to the whole. Also thanks to Katrina Walker and the whole Silk Experience team of teachers and Quilts Ed staff for doing a great job at Quilt Festival. It was very much appreciated. student brought a quilt using her samples from last year! This entry was posted in Experience Silk Exhibit-Houston, Free(r), houston quilt festival, indigo, mandala, quilting, shibori, silk experience, Silk Study Tour to Japan, trade shows, workshops and tagged Deb McClintock, houston, JANM, japanese textiles, Judith Montano, mandala, quilt festival, quilting, shibori, silk, textiles on November 6, 2015 by shiborigirl.